Hope everyone had a wonderful Holiday Season! A friendly reminder to our followers, we have officially began posting The Art Challenge at our other site you can click HERE to check it out and please don’t forget to follow us there so you can keep up with all the great work everyone is putting out! This week our theme is: TIGER! A friendly reminder THIS is our last post for this webpage. Next challenge is a two week challenge and will be the first challenge posted on our new site The Art Challenge Blog! If you have been following here and wish to continue seeing what we create, please check out our new site and follow us there. RJ: Tiger Eye, Pen on paper. RJ’s piece gives me the chills. That deadly expression of the eye with the small visible detail of fur and stripes reminds me exactly why Tigers are dangerous wild predators. I def wouldn’t want to be cross this tiger’s path! I love the hint of facial detail, leaving the rest of the animal to the viewer imagination. Amber – Entertainment, Pen and ink on paper. For this week’s challenge I decided to create an image that illustrates my feelings about animals, like tigers, held captive in zoos and circuses. I love animals and I strongly believe that they don’t belong contained in zoos or used as entertainment in circuses. They belong in the wild and if not there then in sanctuaries where they can live their best life in peace. Next theme is a two week challenge – due to the holiday season – and the theme is: DREAMS COME TRUE. This week our theme was: BLUE! Just a friendly reminder for our followers! Starting the first week of January, Our art challenge will move to a new site. You can click here and check it out! This week my goal was to mix as many different blues as possible. I decided to choose Miro as my inspiration. I simply used a lot of his commonly used shapes and used all blue with a few red accents. I had a friend once tell me that while visiting Barcelona she explored a Museum dedicated to the work of Miro and it was the happiest few hours of her life. Ever since when I see work by Miro, I always smile and feel that joy my friend had described. Looking at Karri’s Miro inspired piece in blue, I am reminded again of that joyous feeling. Great job, Karri! I can’t wait to see this costume come to life! Dylan’s eye for detail never ceases to amaze me. Her sketches are thoughtful and so full of creative passion. I think we all want to be Tori! What a fun piece! I am not personally knowledgeable of the Doctor Who series, but I love the movement of the blue and find myself wanting to know more about this Tardis. lol. I am fascinated with the background of Emily’s piece. The thin watery texture of the blue ink juxtapose against the solid black of lino cut beautifully illustrates the flowers – which reminds me of lotuses – shooting from within dark murky blue water. Beautiful ethereal watercolor. Ina beautifully captured the watery affect of the satin fabric. The movement, the calming color and the serene quality gently pulls the viewers in and invites one to peacefully dream. Amber – blueberries, Acrylic on paper. This week our theme is: TRANSFORMATION! And a short note, we have started an new blog site specifically for the art challenge at https://theartchallengeblog.wordpress.com. Challenges will be posted starting the first week of January. Currently the new site is in progress, but if you are a fan of our Art Challenge please stop by the new blog and follow us there! RJ – Cocoon, pencil on paper. I love Rj’s pencil drawings. His eye for textural detail and ability to depict delicate moments always bring a smile to my face. The butterfly is in the process of emerging, its wings not yet ready to spread out and be fully reveled. The nibbled leaves behind the butterfly reminds the viewer of the caterpillar this new butterfly once was. “I will rise, out of these ashes, rise”. This weeks theme made me think about all the transformation we all make throughout life. Overcoming struggles. Changing our situation or habits. This brought to mind the image of a phoenix, rising from the ashes of an old life. WOW, you can really feel the heat from the Karri’s Phoenix flames! The intensity of the oranges and reds is brilliant against the blue background and definitely reminds a viewer to push forward. I love this positive message to overcome and keep overcoming struggles. Bethany – The Doodle, Pen and color pencil on paper. I am loving Bethany’s creative process and how a simple little doodle transforms into a beautiful landscape. Her pieces depicts how an artist’s mind works and the choices we make along the way. The touch of color added in the end really makes the image glow. Beautiful! Ina – Butterfly, Pencil and watercolor on paper. The colors of this freshly emerging butterfly are gorgeous! Ina’s Butterfly is eager to spread her wings and as a viewer I am eager to see her fly! I love the details of the wings and the light washes of blue in the background juxtapose with the bolder application of color of the butterfly. Beautiful piece!! First we see the calm and clean left side of a residential street and then I find myself falling forward into the black christmas-y side of this piece, like alice in the rabbit hole. The holiday season does have this wonderland whirlwind intoxication feel about them. Emily accurately depict the sudden arrival of the festive decorations and lights. My incomplete piece was inspired by the greek myth of Persephone I wanted to illustrate the transformation of a space or environment when my nieces enter. My twin nieces are depicted as the youthful force of spring, charging into a snowy landscape to liven up the dreary greys of winter. They are fearless, jovial and loving girls. The semi-faceless feminine figure stands in a defiant superhero pose with classic bows attaching each limb to the core. Powerful imagery! I like the choice to making the figure semi-faceless even with this being a biographical piece. Dylan is guiding the viewer to focus on one particular aspect of her identity, her scar and surgeries, and the impact they have had on her life. Strong beautiful piece, Dylan! Emily – Amsterdam Cityscape, Collage on paper. Emily sent in a piece that she worked on for one of her assignments. She didn’t think it related to the theme of Gratitude, but still wanted to show what she was working on. Emily’s piece is a reflection of her observation skills while she was traveling to Amsterdam a couple of weeks ago. In the collage I see a unique culture identity, I feel the tightness of space amongst old architecture in modern times, I sense the layers of history overlapping in the narrow streets, and I relate to the need to creatively react to my environment. I kind of have to disagree about the piece not having much to do with the theme of gratitude. I think Emily has keen observation skills and her piece reflects the details – though these details may not be the intentional meaning behind her piece – that so many folks are grateful for in the city of Amsterdam in a way that is uniquely hers. Me too, Bethany! I love the clean simplicity of the lines and form of the open hand. It correlates perfectly with her statement and further connects the image of a hand with the concept of gratitude. Bethany’s piece reminds me that gratitude has a lot to do with a community and paying forward what we are grateful for. Amber – The Little Artist, Pen, ink and watercolor on paper. I grew up with a very creative family. My great-grandmother was a ceramicist, my mother use to paint murals and found creative ways to make our secondhand clothing and small meager living spaces look and feel special, my father was a tattoo artist and had strong drawing/painting skills, many of my cousins are photographers and of course my extended family includes a plethora of artsy friends. For as long as I can remember I was “The Artist”. The opportunities to creatively express myself since my childhood have been unlimited and I am very grateful for all the love and support I have received by friends and family to pursue the arts. This week our theme is: SPACE! RJ was inspired to create a companion piece to mine (last piece, below) and I am so thrilled with it! There a ‘Alice and the rabbit hole’ charm about it, and I’m a little bit envious of the figure and what he is seeing beyond the space we the viewers stand. Dylan – Untitled, graphite on paper. What a Beautiful experiment! I am completely enthralled by the expression of this beautiful and noble creature, she looks so proud and confident as she gazes outward toward the viewer. Dylan’s line work perfectly captures the strength and elegance of her subjects. Karri’s dreamy representation of space is the kind of image that would inspire anyone with a youthful heart to wish they were an astronaut! Karri has such a beautiful relationship with color, her layering of bold and subtle colors is suggestive of the magnitude of our galaxy and reminds me how complex and spectacular the universe is. Emily’s statement reminds me a lot of a Buddhist teaching about being present in the moment. I see that with her images, the awareness of the moment and the details of the space that she is occupying. I am loving the red ink drawing below. Its a simple ink drawing of a window and lanterns and I find it comforting. I find myself waiting for a friendly face to look out the window and notice me. Val was inspired by the moon seen from our backyard and the space between it and herself. Her photo suggests a longing to connect with the moon, a longing that reaches back generations. Taking the photo in a familiar space invokes the emotional attachment we have with the moon. Amber – Stretching the Void, pen and ink on paper. This piece went through a lot of transformation between the various thumbnail sketches and mental pictures to the final image. I started with an idea that I would fill a page with odd shaped bubbles, each containing a person struggling to stretch the bubble out. Then the image was a single odd shaped bubble with a single person and this bubble was submerged in rubble full of modern distractions and materialism. Eventually, while sketching the final piece, I realized that the image needed to be only this one person struggling to maintain her small space within a void. It felt emotionally accurate to see this sole person fighting for space within space. The nothingness around her is both open and claustrophobic. To our readers and followers, We hope that everyone has a joyful, safe and abundantly happy Thanksgiving with family, friends and the folks that love you the most. Even if you are not in the States celebrating this holiday, we still wish you a wonderful and thoughtful day. This week our theme is VAN GOGH! Van Gogh is famous worldwide for his expressive paintings and tragic life. He is a universal favorite for art lovers. I love this! If Van Gogh was around today, I imagine his famous post ear-cutting self portrait would have look something like this! Only Dylan could make you envious of her mangled ear and blood splattered throat selfie! If I were a skull, I’d prefer the sweet tea over the cigarette too! I love the personal and cultural (nothing beats Southern sweet tea!) twist to one of Van Gogh’s early and probably lesser known works, but what I like most is that Bethany decided to tackle the skeleton. Most people prefer to avoid drawing skeletons, they can be intimidating subjects. Bethany went for it and with beautiful contour lines. Great job Bethany! Emily – Quotes, monotype prints on paper. The prints are messy and I like that about them too! The messiness, in my opinion, gives off an energy similar to that of Van Gogh’s thick, bold and animated strokes. The composition, color choices and quotes remind me of street art. I can visualize these pieces becoming wheatpastes around a city. As a humorous thought, the blue piece looks like the sunflowers are growing out if Van Gogh’s head. Its as if his thoughts/dreams can no longer be contained within his head and are now becoming hair! I loved Van Gogh’s artwork as a kid. He was the first artist that I learned about in grade school and was able to recognize when shown his artwork; this was a major thrill and feeling of accomplishment for a seven year old me. For this week’s challenge I wanted to create a piece that was inspired by one of my favorite Van Gogh paintings, Sunflowers. Karri and I must be kindred Van Gogh spirits! I painted dandelions (surprise!) in a teacup. Dandelions being my equivalent to his sunflowers and of course the teacup instead of a vase made obvious sense for me. Instead of painting with his preferred thick brushstrokes I chose to work in the muted washes that I lean toward. This piece felt like a collaboration between me and an artist that I greatly admire. This week’s theme is DETERMINATION and it appears that we all were feeling determined to complete something of importance. RJ is determined to create a large-scale acrylic painting of this sweet jovial cow! He is in the beginning stages and doesn’t want to rush the process – slow painting is part of the goal – but will keep us informed as he goes! and THAT FACE! Who doesn’t want to be nuzzled by such a face? The bold choice of colors compliment the cheerful persona of this cow and the perspective creates an intimate connection between the viewer and subject. Can’t wait to see it finished! Painting skin can be one of the most stressful accomplishments for an artist! Emily’s work since joining our group has continually and happily surprised me. Just when I think I have a grasp on her evolving style she presents us with a piece that exhibits her growing talent in a different direction. I love the man’s facial expression. You see an elderly man with wrinkles, thinned hair and aging spots; but his eyes and countenance express an observant and youthful mind. Great Job! This week was particularly hectic for me. I was making my final work-trip to Southern Utah and I was working nonstop on the final piece (Nadia) for a portfolio I needed for a residency application. My determination to complete the piece in time for the deadline was a success by three days! Yay me!! Nearby our job-site are a few national parks and I was determined to see as much as I could before work took me away from this magnificent landscape – its not often that I am in this area of the country. I didn’t get to go on the long day hikes as I hoped, but I did succeed in seeing a clear view of the La Sal Mountains from where I stood at Balancing Rock – the first time I was there the mountains were hidden by clouds. I also drove through the CanyonLands and got a small taste of the adventures that I could have, since I am determined to visit again. AND I finally saw Newspaper Rock. I have seen photos of it for years, and saw the sign every time I passed the entrance to Canyonlands. I am fascinated by petroglyphs and the nameless artists who created them thousands of years ago. La Sal Mountains from Balancing Rock in Arches. 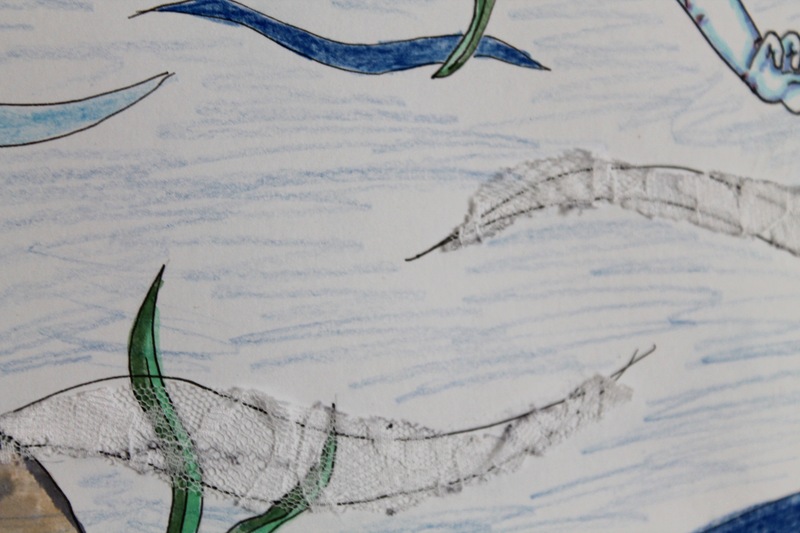 This (two) week’s challenge was to create works of art inspired by the theme: OCEAN. Tony – Ocean Bubbles, color pencil on paper. 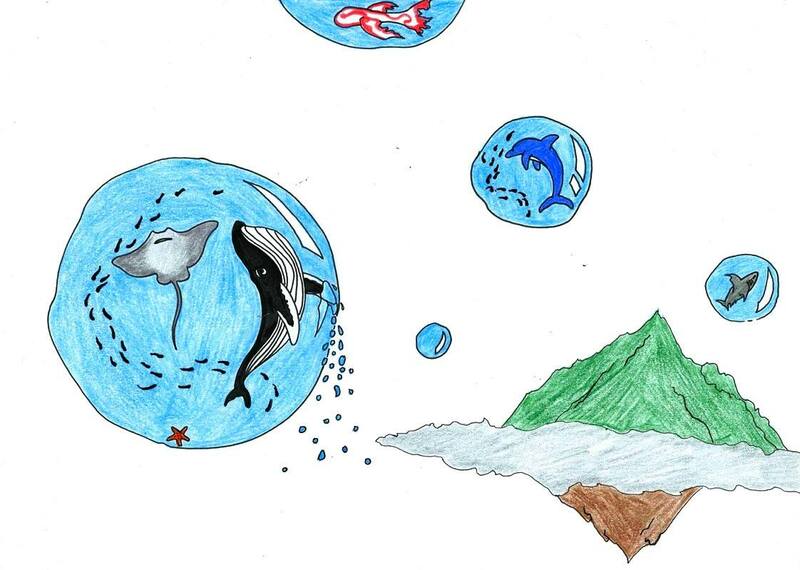 I love the concept of an entire ecosystem floating inside a bubble! It reminds me of those beautiful and artsy glass marbles with swirls of chaotic colors contained within. My favorite detail of Tony’s piece is the whale’s fin skimming the edge of his eco-bubble. For me it signifies that the marine animals might be contained to their individual bubbles, but they are still free and wild creatures. I love the bits of lace, they are a nice subtle texture to the image and references the the wings the siren ditched, beautifully! Looking at the piece, I am reminded of a few literary images. 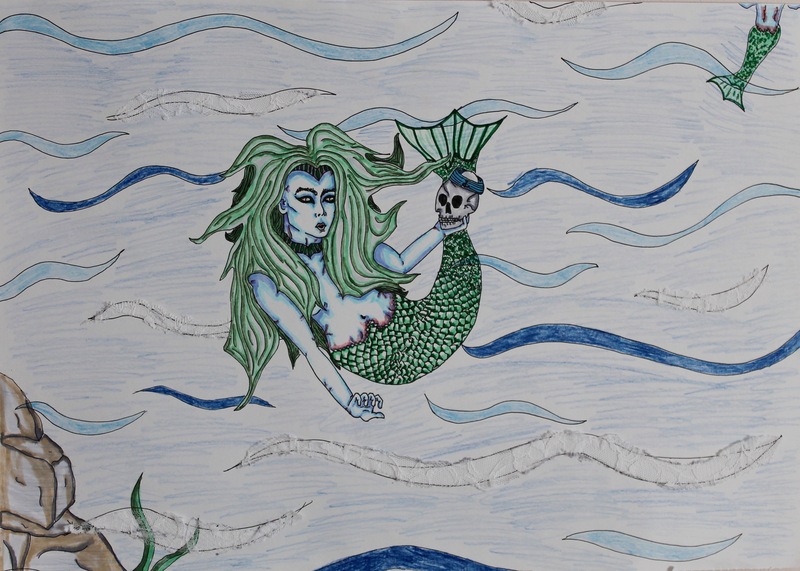 The Sirens reference Greek mythology. Her stitched transformation into a mermaid brings to mind Frankenstein melding with The Little Mermaid. AND, the skull in the hand is a perfect scene to break out some Shakespeare! Bethany’s piece has this strong meditative daydreaming vibe that I can’t get enough of! I want to be this woman with the sea foam green hair and serene expression as she mentally and emotionally returns to a recent happy and peaceful moment. The soft colors only enhance the peaceful calmness of the figure! 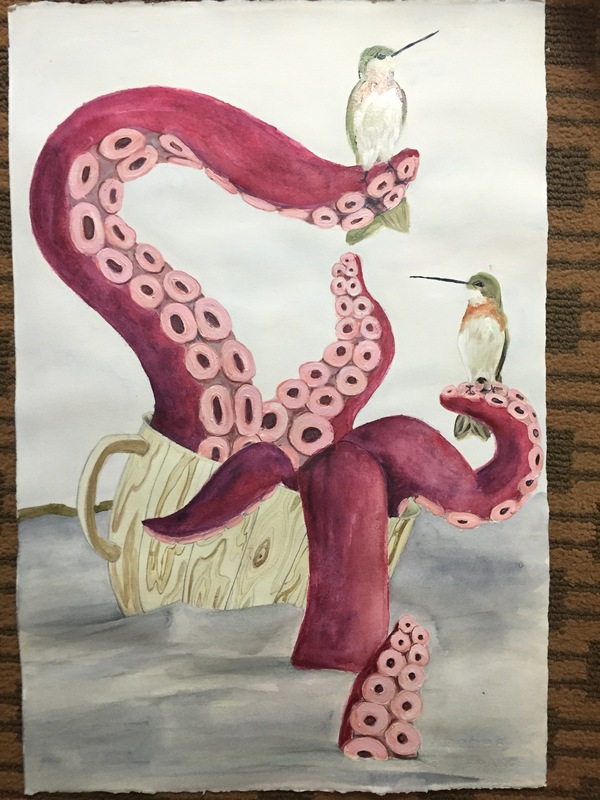 Great job on your first Art Challenge piece, Bethany! This week, I chose to remake a piece that I had made a few weeks ago for a different challenge (Unconventional) in a medium that is more natural for me. I enjoy experimenting with new material, such as duct tape; but it is mixing drawing materials on paper that I swoon for. The ocean is mysterious and vast. Its serene movements and calming blues beckon to our adventurous side and we can’t help but eagerly answer the call. The Voyage is about setting off for the unknown, taking chances and seeing where the tide takes you. RJ’s photograph reminds me that distance is quiet and sometimes peaceful, like a day in the park; and gives us the space needed to see the full picture. 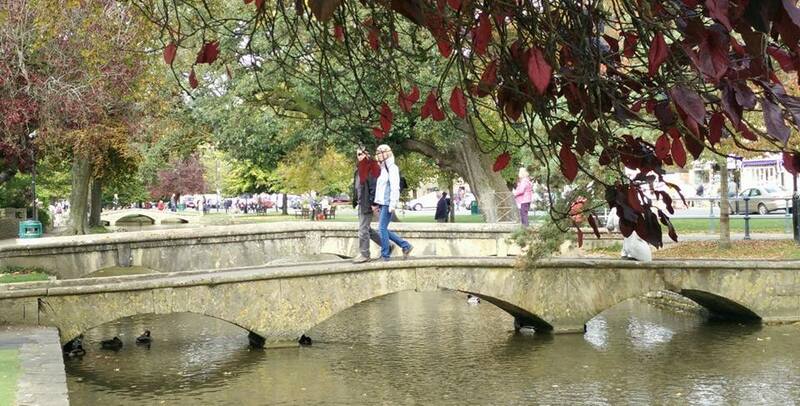 The three bridges along the canal are spaced apart and each with their own story, yet they are connected by the flowing water of the canal and together they form the fuller picture seen from a distance. I love the puzzle aspect of the torn map pieces “fitting nicely” together, despite the distance between the people represented by each piece. 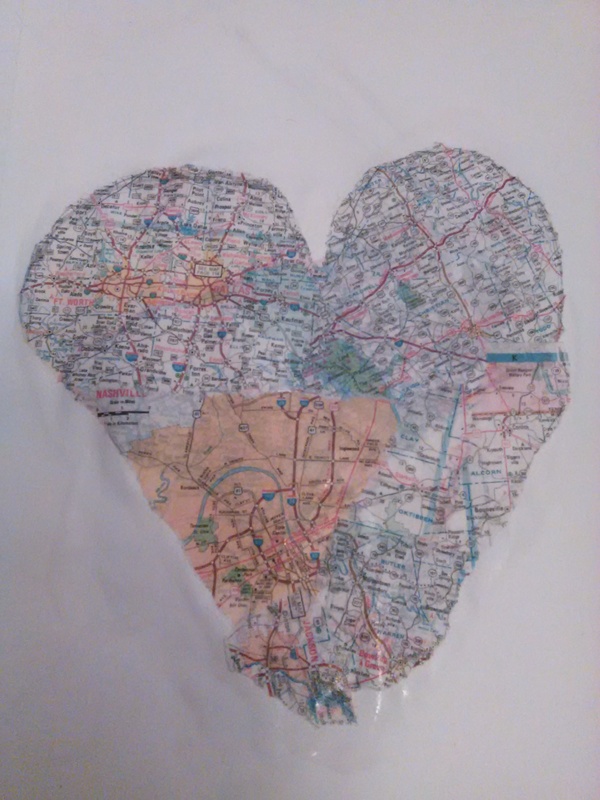 The people that love you will always love you no matter where you are on the map. 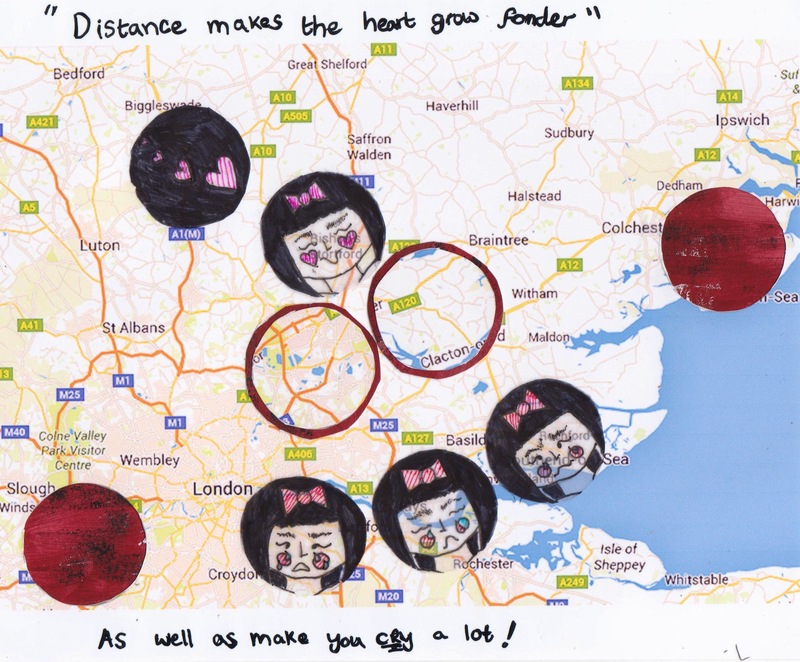 Emily’s piece reflects the distance of the heart and it pulls the viewer into feeling that distance with her. I like the transparency of the faces over the map. Seeing the lines and shapes beneath facial expressions further suggests that distance is more than space between two points, but also an emotion. This was a somewhat difficult challenge for me. I had too many ideas shifting around inside my head. The concept of distance is both spatial and emotional for me, and the two are tightly connected in various ways. When I was seven my mother allowed a rainbow “priest” named Blue to bless me. His blessing (or prediction, depending on how you look at it) was that I would forever wander, that I would find plenty and nothing at all – or something along those lines. He also gave me a piece of glass made from lightening striking the ground and told me I would eventually lose it, I did. I travel a lot, both for work and for pleasure. The happiest years of my life are those with distance covered, the most depressing years are those that were stagnant. The people I love the most in the world are scattered all over it, I am never near enough of them. But, I can’t stop moving about because that is when I will feel the distance from everyone and emotionally shut down. 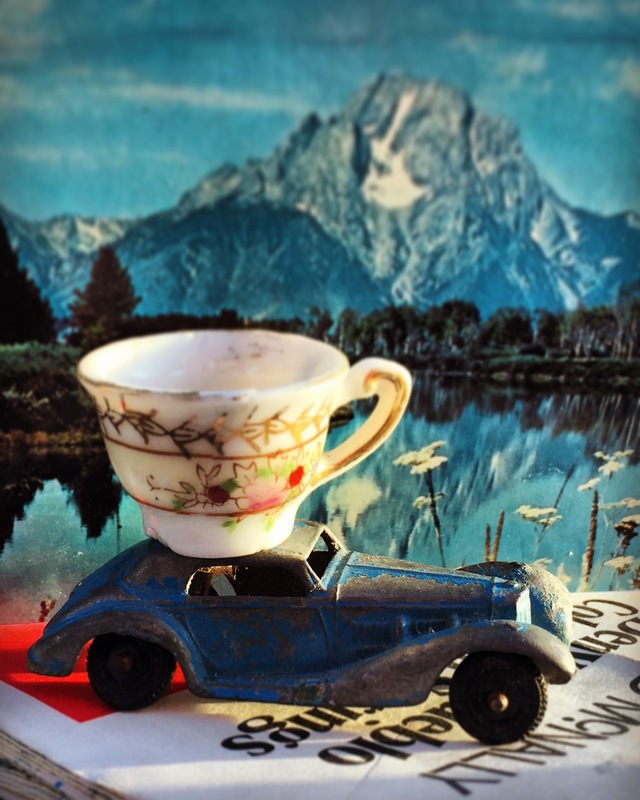 This is a theme that I plan to return to and fully explore in the future, but for now I present a photograph of an antique toy car, an old map of Denver, postcard of Wyoming and a tiny teacup – representing me – to represent the time, emotion and spatial aspects of distance in a way that is connected to me. Next challenge is a two week challenge and the theme is: OCEAN!